The BJP today renominated 37 sitting MLAs, dropping six and bringing in 31 new faces in the first list of candidates for the Maharashtra Assembly election. Former Mumbai Police Commissioner Ranjit Singh Sharma has been accused of plotting to kill Judge S. M. Shembole of the special court hearing the Telgi fake stamp paper case. The BJP appears to be mighty pleased with its main political opponent for giving issues literally on the platter on the eve of Maharashtra Assembly elections. Its president M. Venkaiah Naidu today sought an explanation from the Congress on dropping ‘Gujarat’ from the National Anthem in school textbook of Kerala. Mr Jasbir Singh, a member of the Minorities Commission, Rajasthan, in a statement yesterday appealed to the state and Central governments to ensure that Ms Uma Bharti’s “Tiranga yatra” did not trigger communal frenzy and upset peaceful socio-political environs. 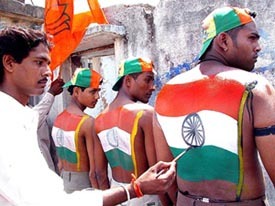 The Election Commission today issued notice to the Bharatiya Janata Party (BJP) asking why the Tiranga yatra not be treated as violation of the model code of conduct. The Railway Ministry has appointed three experts to assist Justice U.C. Banerjee in probing the burning of S-6 coach of the Sabarmati Express at Godhra in February, 2002. On the eve of the crucial CPM politburo meeting, the Left parties hardened their stand on the engagement of experts from multilateral agencies and warned that “its options were open” if the government went ahead with an increase in the foreign direct investment (FDI) in telecom and insurance sector. The Group of Ministers (GoM), constituted by Prime Minister Manmohan Singh to finalise plans for the celebrations in connection with the 350th anniversary of the Taj Mahal, will hold its first meeting here tomorrow. Appearing on behalf of the Birlas on the will controversy at the Calcutta High Court today, Mr Arun Jaitley, BJP minister in the NDA government, pleaded that the Birlas should be allowed to handle the M.P.Birla property worth Rs 5000 crore on various philanthropic works which the late Birla wanted. Union Home Minister Shivraj Patil today said like other citizens, human rights of the armed forces serving the nation should also be taken care of. “They sacrifice their life and limbs for the protection of infants and innocent people. Similarly, their rights also need to be respected,” said Mr Patil at the inaugural function of the 32nd BSF Annual Training Conference. The Delhi High Court dismissed the anticipatory bail plea of Sudhir Sachdeva, a key accused in the CBSE All-India Pre-Medical Test 2004 paper leak case, for the second time today. Tamil Nadu Chief Minister Jayalalithaa today urged Prime Minister Manmohan Singh to drop the proposed move to repeal POTA saying that the law was useful for state governments to combat terrorism. Lok Sabha Deputy Speaker Charanjit Singh Atwal was honoured during the celebrations of 400 years of Sri Guru Granth Sahib at the California State Legislative Assembly hall. Punjab Chief Minister Capt Amarinder Singh and state PCC chief H.S. Hanspal yesterday met Defence Minister Pranab Mukherjee, in charge of the state unit, to discuss names of candidates for the two by-elections in the state. Ajai Bhatia's film "STOP!" is a saga of friendship. The BJP today renominated 37 sitting MLAs, dropping six and bringing in 31 new faces in the first list of candidates for the 288-member Maharashtra Assembly election scheduled to be held on October 13. Releasing the list, BJP president M. Venkaiah Naidu said the party would contest 114 seats, leaving three for the Sharad Joshi’s Shetkari Sangathana. The Shiv Sena, BJP’s ally in Maharashtra, would field candidates on 167 seats, leaving four for the Shetkari Sangathana. Therefore, the Shetkari Sangathana would contest seven seats. The Central Election Committee of the BJP that met under the chairmanship of Mr Naidu also announced the names of candidates for eight Assembly seats in Arunachal Pradesh, while releasing nominees for byelections in Bihar, Assam, Delhi, Gujarat, Jammu and Kashmir, Manipur, Punjab and Uttar Pradesh. In Himachal Pradesh, the party has given ticket to Mr Harbans Rana for the Guler byelection. For Delhi’s Baljeet Nagar and Rajouri Garden Assembly byelections, the party has nominated Mr Raj Kumar Mehra and Mr Ramesh Khanna, respectively. The BJP will contest one Assembly byelection in Punjab where it has decided to field Mr Mahender Pal Singh for the Garshankar Assembly seat. In Jammu and Kashmir, the party is contesting Basohili and Akhnoor byelections for which it has nominated Mr Jagdish Raj Soplia and Mr Ram Saroop Sharma. In Rajasthan, it has decided to nominate Mahant Chand Nath for the Behrore seat and Mr Ram Prasad Bangar for the Merta seat. For the Mainpuri Lok Sabha seat in Uttar Pradesh, the party chose Mr Ram Babu Kushwaha. It has selected Mr Dwarika Prasad Naher, Mr Devender Mani Tripathi and Baij Nath Rawat for Ahirori, Milikipur and Siddhapur Assembly byelections. The meeting was attended by former Prime Minister Atal Bihari Vajpayee, Leader of the Opposition L.K. Advani, party general secretary Pramod Mahajan and former Deputy Chief Minister of Maharashtra Gopinath Munde, among others. Mr Munde and senior leaders, Eknath Khadse, Shobhatai Phadnavis and Daulatrao Aher, are among the 37 MLAs renominated by the party for the Maharashtra Assembly election. The party announced the first list of 83 candidates. Rest of the names would be cleared in the next few days, Mr Naidu said. For the first time in Mumbai, the BJP has accommodated 10 non-Marathi speaking candidates in the 30 announced seats. 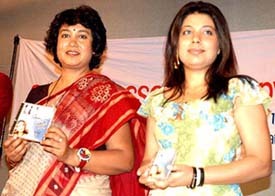 Besides Ms Shobhatai Phadnavis, the only other woman who got the ticket was Dr Naina Sirsat Patil. There are seven Scheduled Tribe and Scheduled Caste candidates. Mr Munde would contest from Renapur, while Ms Phadnavis would contest from Saoli and Mr Kadse would contest from Nashik. Those who have been denied tickets include Appa Gogte (Deogad) Hemendra Mehta (Borivli), Ms Goyal (Matunga), Bade (Patharni) and Kale Shilore. The allegations were made by Abdul Rehman, Telgi’s counsel, in the Bombay High Court. Judge Shembole heads the special court in Pune constituted under the Maharashtra Control of Organised Crime Act (MCOCA) court. The case is being probed by the CBI. In his letter to the Bombay High Court, Rehman alleged that Sharma was linked to the underworld. “He has strong ties with the underworld especially with members of the notorious Dawood Ibrahim gang,” Mr Rehman said. The lawyer alleged that the Dawood Ibrahim gang planned to kill Judge Shembole in a fake road accident to intimidate the judiciary. Rehman further alleged that the Dawood Ibrahim gang had invested Rs 12,000 crore in the fake stamp paper racket. Rehman told reporters outside the court that he would soon file a petition in the Supreme Court as well. Rehman further alleged that the underworld planned to kill Shembole on September 14 in Pune where he had gone to appear for Telgi in a case that was to come up on September 15. Rehman has now asked the authorities to ensure proper security to Shembole. He further added that in case the High Court wants to treat his letter as a petition, he was willing to return to Mumbai and file his detailed statement. July 23 and asked him not to reveal details of the fake stamp paper racket. He told mediapersons that politicians and police officers from Maharashtra, Karnataka and Delhi were involved and if timely action had been taken, around Rs 30,000 crore of government revenue could have been saved. “First the tainted ministers, insult of Veer Savarkar, arrest of former Madhya Pradesh Chief Minister Uma Bharti and now amendment of the National Anthem by omitting Gujarat,” Mr Naidu said pointing out to the series of issues that have given his party a chance to go to the people. Not only the BJP, but also Gujarat Chief Minister Narendra Modi owes a “big thank” to the Congress as the Chief Minister, who had been lying low for all these weeks, has now got an issue to raise passion among Gujaratis. Mr Modi and the state unit of the BJP are going to launch a statewide movement in protest against the Kerala Government’s alleged attempt to amend the National Anthem. The BJP will make use of Mr Modi in Maharashtra elections where Gujaratis are in seizable numbers. 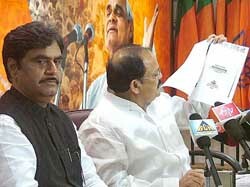 Mr Naidu said the BJP condemns the Congress-led government in Kerala for its insult to the National Anthem. “When the BJP unit in the state protested against the scandalous omission, the state government gave an assurance that it would be corrected,” Mr Naidu said. “It is difficult to believe that a printing error could have occurred for two consecutive years,” he added. Taking exception to the UPA government’s decision to order an inquiry into the allotment of land in New Delhi to various social, religious, cultural and educational institutions by the NDA government, he said “our” government did the right thing by allotting, for the first time, land in the Capital to several nationalist organisations engaged in educational, social and cultural activities. “If there has to be an inquiry, let there be one that goes into all the land allotment decisions of various Congress and Congress-supported governments since 1947,” Mr Naidu said. He also asked the Congress-led UPA government to break its silence on population control issue. Ms Uma Bharti’s yatra is to reach Rajasthan at Dholpur on September 20. Mr Jasbir Singh noted with regret that “the intemperate tone and tenor of the language being used by the saint-turned-politician and other top BJP leaders and Sangh Parivar against the democratically elected Prime Minister and the Congress President are obviously meant to arouse communal and fascist forces of our society”. Jasbir Singh reminded that thousands of skilled and unskilled labourers of Rajasthan and many other States were working in the Islamic Gulf States and Saudi Arabia and Iraq. As such, he cautioned that nothing should be done to provoke the forces that might make the lives our brethren living in those countries miserable. The notice, returnable within seven days, was issued on an individual complaint made to the commission recently. The complainant said that the yatra is violative of Section 123 of the Representation of the People Act. Railway Minister Laloo Prasad Yadav secured Cabinet approval for holding a fresh inquiry into the incident by a retired judge of the Supreme Court, early this month. The experts are Mr K. Balakesari, a retired member (staff) of the Railway Board who also served as Chief Mechanical Engineer with the Southern Railway, Mr S.K. Khanna, a retired member (electrical) of the Railway Board, and Mr S.K. Dheri, retired Chief Fire Officer, Delhi Fire Services. A Joint Secretary-level officer of the Indian Railway Traffic Service (IRTS), Mr Sanjiv Garg, has been appointed secretary of the committee. With headquarter in New Delhi, the committee will submit its findings in three months. Mr Balakesari will operate from Chennai as his headquarters. The committee visited Godhra yesterday for preliminary inspection of the burnt coach. While announcing a fresh probe into the Godhra fire, Mr Laloo had hinted at extension of the three-month deadline for completing the probe, if necessary. Incidentally, the Union Cabinet is meeting tomorrow and is expected to take up the issue of hike in telecom sector from 49 per cent to 74 per cent. CPM politburo member Sitaram Yechury, who had met Congress president Sonia Gandhi, Prime Minister Manmohan Singh and Deputy Chairman Planning Commission Montek Singh Ahluwalia on the FDI and Plan panel issue, said the government had not given any assurance. He said the government had kept its options open on FDI the day they made the announcement, while adding “we also have our options open”. The meeting is of importance from the point of view of the Uttar Pradesh Government that had decided to go ahead with its own programmes to kick off the originally planned year-long celebrations from September 27, World Tourism day. The group, formed on September 1 with the objective of identifying, approving and putting in motion all programmes for the celebrations, could not meet earlier due to various reasons. These included the absence of the panel chairman and Human Resource Development Minister Arjun Singh, who was away to Geneva to attend a UNESCO conference. Incidentally, Tourism Minister Renuka Chowdhary, who is also one of the five members of the group, will not attend tomorrow’s meeting as she has left for an official tour of Europe. In fact, the constitution of the group has cast a shadow on certain decisions taken at a joint meeting of top officials of the Union Tourism and Cultural ministries and the UP Tourism. The group was constituted after the joint meeting decided to organise six programmes at Mehtab Bagh, behind the Taj Mahal, as part of celebrations in Agra. Other members of the group are: Culture Minister S. Jaipal Reddy, Environment and Forests Minister A. Raja and Uttar Pradesh Chief Minister Mulayam Singh Yadav. Reports here suggest that the meeting is also expected to take a fresh look at the programmes finalised at the joint meeting, besides considering the series of proposals suggested by the UP Tourism. Among the proposals, the UP Tourism wants to raise the issue of the prevailing prohibition on night viewing of the Taj Mahal imposed in view of the perceived security threat following ‘Operation Bluestar’ in Punjab. The UP Tourism’s proposal was to allow tourists inside the Taj Mahal complex in the night of full moon day and two preceding and two following days, for one year. The UP Tourism also proposed cultural programmes on Fridays, Saturdays and Sundays during the celebration at Mehtab Bagh, where the last programme was held in 1998 when famous singer Yanni staged a concert. It also proposed plays and dances in the Diwan-e-Aam and Diwan-e-Khaas in the Agra Fort. The Akbar’s tomb at Sikandra was proposed as the venue for Sufi music and qawwali and variety programmes at Fatehpur Sikri and Shilp Gram. He argued that R.S.Lodha who is an outsider to the Birla family, could not have any legal and moral right on the property merely on the basis of a “questionable” will, bequeathing the entire property to him by M.P. Birla’s widow Priyamvada Birla. On the other hand, counsel for the Lodhas Aninda Mitra claimed that Priyamvada’s will was “a genuine legal and registered document” which could be challenged. He said Lodha would also spend the entire money on social welfare works, which had been already started jointly by Lodha and Priyamvada. He demanded that the caveat petitions filed by the Birlas challenging Priyamvada’s will should be rejected forthwith and the probate be given to Priyamvada’s will so that Lodha could re-start the incomplete works already launched and take up several other philanthropic works which both M.P. Birla and Priyamvada Birla had desired. The hearing was incomplete and will be again heard on Wednesday by Mr Justice K.J. Sengupta, who had directed the Birlas to submit the original deed of the will within 10, of which, only a photostat copy had been presented. The court also asked Lodha to present the registered document of Priyamvada’s will bequeathing M.P. Birla’s property worth Rs 5000 crore to him at the earliest. Lodha’s counsel told the court today that the registered will document would be submitted in due course. He said that since the two witnesses to the will were now out of station, they would need a few days for their return. Appreciating the concern among forces to sensitise their rank and file in the observance of these rights, he hoped that the BSF would remain ever conscious to this aspect. Mr Justice B.N. Chaturvedi turned down Sachdeva’s petition, saying there was no change in circumstances since the last his application had been dismissed. Sachdeva’s Counsel Chetan Sharma had put forth that his residence and office had been searched a few days ago and nothing incriminating had been found. This was the second time Sachdeva had moved court for a bail. On July 23, Mr Justice J.P. Singh had dismissed his anticipatory bail plea in view of the seriousness of the offence involved. Sudhir had earlier secured a six-week anticipatory bail from the Orissa High Court and approached the Delhi High Court on its expiry. The accused had appeared for questioning before the Economic Offences Wing of the city police, which could not arrest him because he was on bail. The police have alleged that in April this year Sudhir and a manager of an institute run by him made a deal with a Central Board for Secondary Education employee to make available the test papers to the private institute before the exam date. Ms Jayalalithaa, who met the Prime Minister for nearly 35 minutes, said any move to repeal POTA would leave states without a viable mechanism to counter the threat from terrorist outfits and subversive elements. She also reportedly urged the Prime Minister to convene a meeting of the Cauvery River Authority soon and direct Karnataka to release water for Tamil Nadu. Mr Chatwal, who is on a visit to the USA, was honoured by California Lieut-Governor Cruz Bustamante in the presence of members of Senate, California state legislatures and leaders of various communities. Speaking on the occasion, Mr Bustamante talked of the role of the Sikh community in the progress of the USA. According to Lok Sabha secretariat, Mr Atwal presented a memento to the Lieut-Governor. Sources said the candidates were shortlisted at the late evening meeting, which lasted for nearly an hour. The names will be declared after approval by Congress president Sonia Gandhi.